Today we’re making savoury hand pies with fresh zucchini, feta, ricotta and delicious flaky kourou dough. Enjoy! In a medium bowl mix together zucchini, feta and ricotta cheese. Add the mint, the egg and the semolina. Stir well and set aside. Put the dough on a well floured surface. Roll it out into a square 50 x 50cm / 19.6 x 19.6 inches, 0,5cm / 0.19” thick. With a knife or a pizza cutter cut it into 12 pieces. Brush with egg white before adding the filling to avoid soggy bottoms. 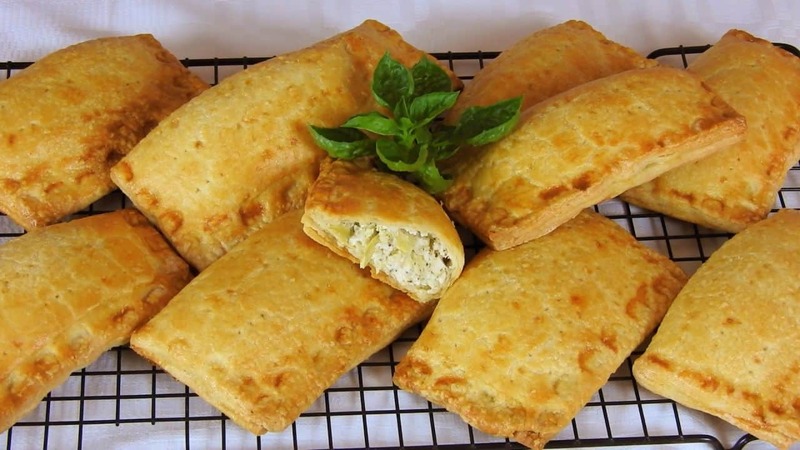 Fill the hand pies with the zucchini – cheese mixture. Fold over and press slightly. Seal the edges and arrange them on paper lined baking trays. Prick their tops with a fork to allow air circulation during baking. TIP: Refrigerating them for 30 min before baking will make them even better! Beat the egg and mix it with the milk. Brush the hand pies. Bake in a preheated oven, at 200⁰C / 400⁰F, for 35 minutes. Enjoy!! !